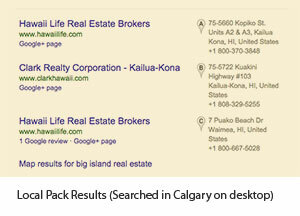 Recently, I found myself Googling for “big island real estate” as part of a new client project. Imagine my surprise when a trio of business listings appeared near the top of the page as local search results. Otherwise known as the Local Pack, this group of listings – presumably – is intended to display local (nearby) business listings. A quick peek at Google Maps (the most importand Local SEO factor of all) – and a quick glance at fresh snow outside my office window – confirmed that we do not, in fact, have any Hawaii-based Realtors any closer than around 3,000 miles from my offices in Calgary. Searching for a Vietnamese Restaurant from my office desktop computer (connected through Wi-Fi on Cable and presumably based on my IP address) brings me results from down the street, while a mobile search on LTE from the same office yields results from Vancouver (600 miles away). A search for business telephone provider displays a local pack that includes a business with a terribly neglected and outdated website with 1 inbound link and a Google places listing, trumping some of the biggest players’ exceptionally strong organic rankings, pushing the organics further down the page. In a search for a pizza parlour, four of the five local listings showed pizza joints that were a 40 minute drive away, while many pizza places I’m familiar with are almost within walking distance. So what gives? Google’s stated intent is to be helpful for searchers and the “Local Pack” is supposed to be especially important for mobiles. If that’s true, why is Google’s local search algorithm all over the map? +Randy Milanovic that should not be happening. I just did a search using similar conditions and got similar messed up results for my location and I am half a world away. Each time, in the past, we had issues like that, Google was rebuilding the Index because the Entity Graph was being enriched and, usually, new filters were being applied or current filters were being refined. It may well be the case here - it just needs monitoring over a week or so before we can reach any conclusions. ...it's only a guess at the moment on a single point of data but we are both seeing the mess, which in itself is unusual. It would be good to get a few more eyeballs on this. Could high local search volume for big island rest estate trip the Hawaii pack in a non local area? ...it is possible. Local search now has the same signals as global search. Logically a 'local' volume search that is non-local should not contaminate the signal this way, that's just crazy. If it does, something else is happening. As a web searcher, getting inconsistent local results can be a minor annoyance. As a marketer though, it raises bigger questions about which best practices you can rely upon when it’s not clear what, if anything, is working on the local aspects of your SEO/ranking efforts. To get to the bottom of this and make a little more sense of things, let’s consider the following… first, that Google’s local search results are very much a work in progress – experimental even. 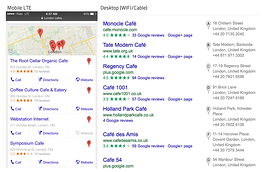 The search leader is tinkering with when, if, and how the local search pack is displayed. Our best guess would be that things like search type, user location, and search/searcher history all come into play. For example, Google may be giving “local” Calgary search results for “big island real estate” simply because countless Canadian snowbirds have looked it up before (and who could blame us)? 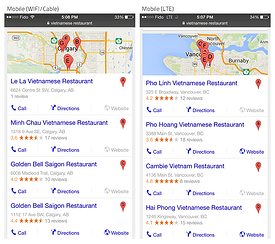 Second, local search is very obviously factored differently for mobile results. Although the location of your provider’s nearest cell tower undoubtedly affects things, it stands to reason that Google anticipates you will be able to walk, or take a short drive, when searching on a mobile device. The counter assumption is that you might be willing to travel a bit farther if you’re searching from a desktop or laptop computer, simply because you aren’t on the move yet. And finally, local search results are being populated with businesses that have a Google+ profile. In other words, the smallest shop with an existing and active social presence could rank ahead of you, even if you’ve done extensive local SEO work and have a powerful organically-ranked site, but overlooked the GooglePlus profile/page or are not keeping it active. First, make sure you’re doing the basics to make your website easy to find. That includes a few of the traditional SEO tasks, of course, but also involves having things like accurate mapping, driving directions, and telephone numbers on your website. When you make it easy for people to find and contact you, you are also making it easier for Google to place you geographically at the same time. Create, complete, and claim your business’s Google+ profile. In the short term, at least, it looks like Google is going to be prioritizing businesses with a G+ presence, so make sure yours is all set up and ready to use. Better yet, post to it regularly and get as many reviews and connections as you can – doing so might put you atop the local search listings. Beyond its own social information, Google seems to be looking for outside cues from other local websites (such as Yelp and Houzz) for corroborating information. So make sure your business is easy to find on those sites, as well. It’s good local SEO, and would be great for your local marketing and ranking efforts even if it weren’t. This is a confusing time for local SEO, and it’s likely things will keep changing in the coming months. But by understanding what Google wants right now, you can take a few simple steps to make your business easier for buyers in your neighbourhood to find. Some sage advice from Wesley Young – Local Search Association’s vice president of Public Policy: Make sure to prominently include information about your location in all mobile marketing. Much of the time, location is key information that users are searching for and it will improve the performance of your mobile campaigns. He blogs about the industry on the Local Search Insider blog.